The silverbell is considered to be one of the best native trees for shady sites. It is a low-branching tree best used in shade or woodland gardens where it can reach heights of 30-40 feet with a spread of 20-35 feet. The silverbell prefers moist, well-drained, humus-rich soil. 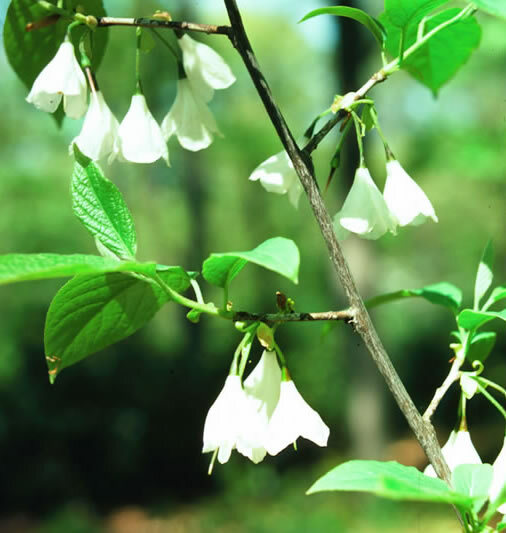 The Carolina silverbell is another plant that provides year-round interest. In spring, before the leaves emerge, clusters of bell-shaped, white flowers bloom on the previous year’s growth. In fall, the leaves become golden yellow and persist for two to three weeks and, when they drop, unveil the winged seed pods that dangle from the branches. The bark which, on younger trees, is dark with light yellow stripes provides winter interest.